Apple News is the most polished. Google News knows the most about what you're interested in. And Microsoft News thinks it knows best. You could predict all of this just from how these technology companies have always behaved but now they're hoping to control the news you read in apps too. As a result of their distinctive company philosophies, each of these three have clear advantages and each have minor disadvantages. Then while all are on iOS -- and all are free -- you also need to think about whether you'll want to read on your phone, Apple Watch, Mac, or in a web browser. Unless you're going to read all three news services, all the time, this is how to pick the right one for you. In some way this is the newest kid on the block as Google News has been formed from the ashes both of what was Google News & Weather and of Google Play Newsstand. The current app combines the features of these in to one package that is fast to get started with and quick to fill you in on everything you want to know. The speed of starting is because Google doesn't stop to ask what topics you're interested in: it uses information the company has already gathered from articles you read in Chrome, or what you search for, to get you started. You can, though, fine tune Google News by working through its options in the iOS app. Tap on Favorites and then you can work through topics, sources and locations to define what you're interested in. Google News is also the easiest to use when you want to block a news service. Say you have strong feelings about one venue or another and just can't bear to see anything else from them. The first time you see a story in Google News from them, you can tap to bring up preferences and choose Hide stories, for instance. More than the speed of finding what topics you're interested in, Google News leverages the company's strength as a search engine to fill you in on all the details you want. While it will present a news story from a site such as CNN, Fox News, or wherever, it will also always give you an important extra option. Under each story there is an option called View Full Coverage. Tap that and you get to see how the same story is being covered elsewhere. That elsewhere does include other news sites but it will gather together opinion pieces, videos, and Twitter. That feature is the reason to use the Google News app. It's the reason to put up with Google's traditional clunky design. And it may be another reason to put up with Google's other tradition, the trade-off you have to make between features and privacy. Security aside, the reasons not to use Google News are that there is no Apple Watch version nor a Mac one. However, you can access Google News from your web browser so it effectively has a desktop app. Microsoft News for iOS doesn't force you to select favorite topics or subjects either. By default, it presents a roundup of news based on your country. It does also have a prominent localization button. The first time you tap that, you get asked for permission for the app to calculate where you are. Thereafter, the button takes you to extremely local news sources like your county's weekly newspaper. You can instead specify that you want to read about another particular area you specify. It would be good to be able to maintain both your local area news and another selected region such as where you work. However, this ability to look locally comes with Microsoft News offering you as many different local news sources as it can find. That's the closest you can get to Google News's Full Stories feature. The trouble is that you know which of your local news sources is worth paying attention to -- and Microsoft News does not. If you could tell it, that would be one thing, but you can't and that's the key failing of this app. Microsoft won't let you block a news service and so very often you'll read a headline before you see that it's from paper you know doesn't work for you. Then, too, there is really only the iOS app for Microsoft News. You can get an Android version but for Apple users there's no Mac edition. Strictly speaking there isn't a web version either but Microsoft News does power MSN.com. Apple News is the only one of these three that has an iOS, Apple Watch and Mac app. However, that Mac app is really the iOS one ported over for macOS Mojave. Being from Apple, it knows little about you but Siri will recommend news stories and sources based on what you choose to do with your iPhone. It's not Apple tracking you, it's your iPhone learning what you like. You do need to do that to get the most out of Apple News, but even without it, the app delivers you the main stories from your local region. It's a feature called Top Stories and tends to be national or state headlines but the selection is curated by an editorial team at Apple. Apple News is almost as good as Google News at letting you remove news services you don't trust or don't like. In this case, you need to find a story from there and tap on the Dislike button. That adds the site to a list that Apple News won't use. Or rather, it eventually won't use it. While Apple says that iCloud keeps this in sync, when testing for this article, we found we had to dislike a few stories before it dropped a source and also that having done that on our iPhone, we had to do it on iPad too. Of these three news apps, Apple News looks the best. You expected that but Apple has done a nice job of presenting a lot of information in a small space. It's easier to pick a loser. Microsoft News is fine, it's just not much more than that. If there were no alternatives, we'd be using Microsoft News. However, there are alternatives and every sensible news junkie should be going for Google News. We say that with absolute certainty -- and yet we find ourselves reading Apple News instead. That is because it's just a pleasant reading experience on iOS. That is because having the iOS app now on our Macs as well means we get to use the same one on all our screens. And actually the fact that we use it everywhere means it is learning what we do or don't like. It just lacks that Full Stories feature that we so love. For day to day keeping up with events, we're on Apple News. When we need to know more, we fire up Google News. The Apple News app is not even available in this geo, so it is pretty meh. I don't do Google or Microsoft. Use an RSS reader like Inoreader and build your own custom newsfeed. Google wins on walk-over, since Apple News isn't available in the rest of the world. First of all let's focus on content and subscriptions. Look and feel is secondary if I receive mediocre news or biased news towards one or the other direction (media interpretation of facts is not news - plain reporting is news). Then that's an advantage to Google News. It gives you the option of seeing all sides of a story, not just the one the news service chose to offer you. But yes the imges I've seen of Apple News do look very nice. How about focusing on trust? Who is naive enough to trust any of these politically jaded tech corporations to be the filter, funnel, and truth finder for news? No thanks. Agreed. I use Twitter accounts for this purpose. 1) What is happening? What is the complete, unvarnished, unembellished story? 2) What are the far-right and far-left crazies saying? What are they spinning and how are they spinning it? I occasionally use Apple News, but mostly I just go right to the sources I prefer. However, as more and more legitimate, unbiased news services go to subscription models, that's getting harder to do. I hesitate to purchase a subscription because, usually, I only like to scan for those articles that interest me and disregard the other 95%. ... That's where I look forward to a proposed Apple subscription service opening up some closed sources. 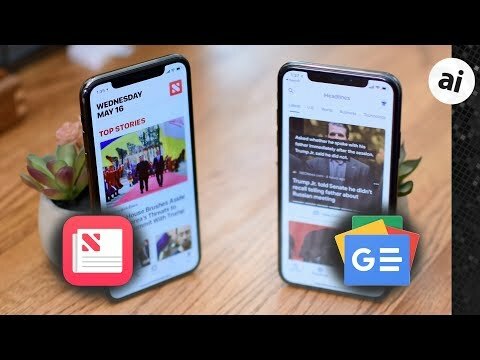 I use the Apple news app on the phone and Microsoft news on computer browser. I'll tell you that Apple news app does much better job presenting a wider variety of news sources even when you pre select need feed. They are trying to keep you out of news bubble. Microsoft tends push you to news items they want you to see or what they think you want to see so your in their news bubble. I have been liking the Apple news app since I have been reading articles I probably would not have search out to read. I like Apple News, but only so I know what mainstream media wants me to read, trash articles to waste some time on. Certainly if you want facts, context, and desire understand the world, unbiased, not US focussed, these news services are not the way to go. Sounds like you might also like News360. That's what I've been using on a Pixelbook and it's really ideal for an iPad or Mac screen. Clean, easy to navigate and great looking to boot. If you like coming across articles you might not have expected I think it's something you should take a look at. I know that Apple News is available on Mojave since Beta 1 but I have only fired it up one time just to see that it was there and seemed to be working. I was somewhat annoyed that it enables notifications by default on my Mac. Turned those off. I wasn't asking for Apple News on the Mac, so having it there doesn't matter to me at this point in time. On the other hand, these news aggregators are perfectly suited for the iPad and Apple News is certainly good enough to no longer warrant installing Flipboard. I probably don't exploit it to its full potential, but it does seem to have a great deal of redundancy builtin by default. I have no desire to increase my Google footprint even further, so unless there i something I'm actually missing out on by not using Google News - what's the point? Does Google News have any exclusive content or better content that Apple News does not have? Apple News is not available outside the US, UK and Australia (there are workarounds though) so that automatically knocks a few points off. This is the kind of nonsense that shows up in the Stocks app. Apple needs better algorithms. I still prefer Flipboard on my mobile devices. I have over 100 curated sources and I love the format. I have used all three but in the past I mostly used Google on my Mac and Apple news on my other Apple devices. Then Google changed the whole format of Google news and I hated it so I stopped using it. I was very happy when Mojave got the News app. So now I use Apple news on all of my Apple devices. I also have a few goto web sites that I also use for my source of news. The same with the Google stock app it used to be my goto place for my stock information. Loaded all of my owned stocks into it and they then went and changed it. I no longer use it and I am now using the Apple stock app. Very happy with it. The News App on MacOS (2017 rose gold MacBook) is my favorite Mohave update! I still have Time Magazine delivered and buy the WSJ Saturday edition every weekend. I use my AppleWatch Series 0, primarily for running (and telling time/temp thru-out the day). I don't even use my iPad, or my iMac anymore. Back to my MacBook...printing about 1 piece of paper a month, less and less email, using iCal, iTunes, Safari, Notes. Oh! And getting into Audiobooks on Books. No FaceBook, no Twitter, no Google, no MS, minimal Amazon/Prime, and no third party apps! a search and see a headline That interest me. I would really like all three, really all of them to let you pick your sources and REMEMBER you choices.